Like with any course delivery the planning and preparation to get to the first day is the hardest. 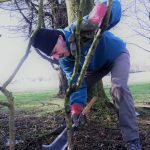 We set up camp 2 days before to gives us time to organise the insulated land rover tent, gather firewood from Bishopston’s small woodland opposite the recreation ground and give a final sharpening of hedge tools. Nick and Rob were with us for 4 days and Rob’s two daughters joined us for the first day while Lewis Rob’s son joined us for the last 2 days. 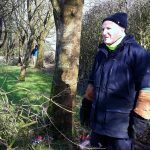 The first day was full of introductions, not only to each other but how to cut with tools, find hedge stakes and have a discussion on the wider issues of the importance of hedges in our shared environment. It was very interesting to listen to Georgina and Catherine as young teachers who have experience in teaching environmental issues such as climate change to primary school children. It was here in which we began the discussion on the hedge styles and those relevant to this area. 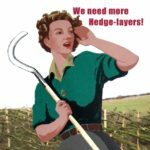 Of course hedge styles develop in response to particular agricultural and climatic conditions. The Gower has in the past been a sheep farming area coupled with a strong south westerly wind. Consequently high bank low ‘flying hedges’ dominated the area. 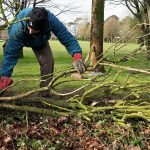 The recreation ground hedge is not on a bank and does not need to keep sheep in but often restrict human access to certain entry points. 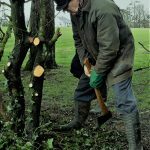 Therefore the Midland hedge is the chosen style. 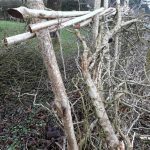 However the Midland hedge is a good foundation for any hedge layer because once mastered you can transfer those skills to pretty much tackle any other type with practice. 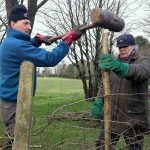 The second day started with Nick and Rob really getting stuck into pleaching and laying their section of the hedge. The weather being cold but bright enabled the men to make good progress and start understanding firsthand the physical skills as well as all the decisions that are to be made to control shape and density. 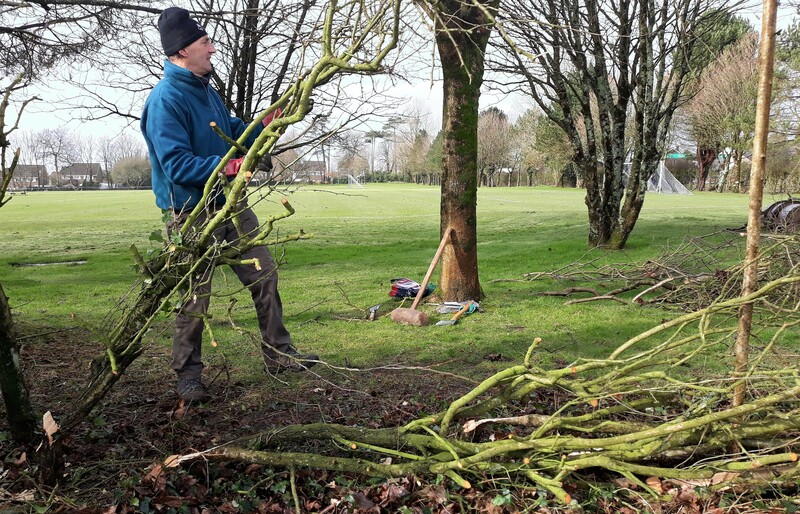 One of the issues at Bishopston is that the hedge is thin in places and occasionally a large gap will form especially where large trees dominate and suppress the hedge either side or in Bishopston’s case where trees have been removed. 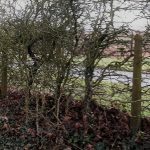 For this replanting the gaps are essential but if the hedge needs to be stock or person proof immediately, it is a case of dead hedging the gap. 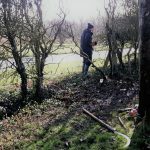 This is where hedge material extracted elsewhere along the hedge is pushed into the gap to create a dense barrier. On the third day Nick worked on his own through nasty rain, with help from Bob Smith the instructor. A miserable day but sometimes it is necessary to crack on with a job. However it also helps to have a camp nearby where you can stop, sit and get warm by a wood burner, dry yourself and drink tea! The portable camp is designed to be set up close to any job for that precise reason; it makes the logistics much easier and achievable by people of all ages. Rob and his son Lewis completed their course in the final weekend. 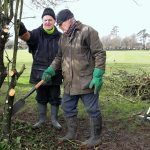 Both made very good progress on the hedge. 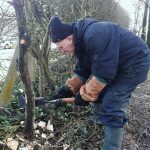 All the students hope to do some volunteer hedge laying before the season ends in March.